Ganesh Jayaraman topped the WSOP-C UK Main Event chip counts on Day 1C and now leads overall. 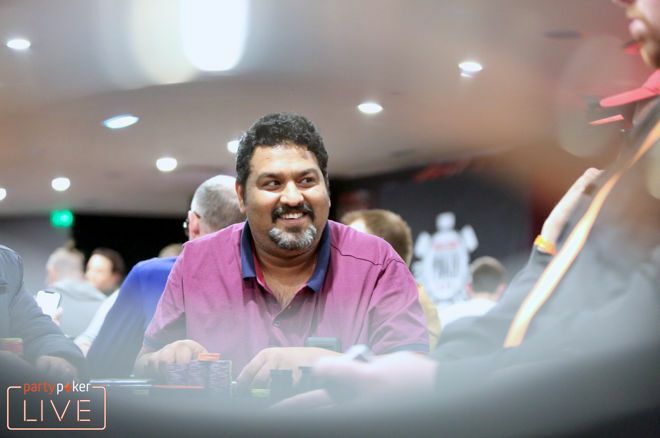 The penultimate starting flight of the 2019 World Series of Poker Circuit (WSOP-C) UK Main Event saw Ganesh Jayaraman finish at the top of the chip counts for Day 1C and for the £1 million guaranteed tournament overall. Day 1C was the busiest flight by far for the £1,100 buy-in WSOP-C UK Main Event with 381-entries processed by the Dusk Till Dawn cashiers. Ten levels later, only 166 of those starters had chips in front of them requiring bagging and tagging and none of them had more chips than Jayaraman. Jayaraman is a regular at Dusk Till Dawn with all 32 of his live poker tournament cashes stemming from his play at the Nottingham-based venue. His largest cash to date weighs in at £13,750, his reward for winning the £330 DTD Original Deepstack in Jan. 2019. Jayaraman will be hoping to beat that sum by lasting the distance in this huge event. Plenty of notable players advanced to Saturday’s Day 2 and gave themselves a realistic shot of a massive prize. Timothy Chung bagged up 273,000 chips at the close of play, closely followed by Sylvia Hewitt on 247,800 and Fraser MacIntyre on 237,800. Other grinders punching their Day 2 ticket included Andrew Hills (229,200), Phillip Huxley (205,200), Kelly Saxby (180,300), Grosvenor Poker’s Jeff Kimber (155,000), Andrew Hulme (153,200), partypoker pro Marcel Luske (152,000), Martyn Frey (151,600), 888poker’s Martin Jacobson (148,900), Jack Sinclair (145,500), Deborah Worley-Roberts (135,100), Paul Jackson (94,000), Chris Vernon (43,000), Paul Newey (42,400) and Mitch Johnson (29,900). Day 1D started at 10:00 a.m. on Apr. 12 and was a six-handed turbo affair although it is not the last chance saloon for those wanting to play in the £1 million guaranteed Main Event because late registration is available for two levels of Day 2 that starts at 2:00 p.m. on Apr. 12.